Do you like chocolate? Do you like peanut butter? Do you like sugary dessert-y goodness? 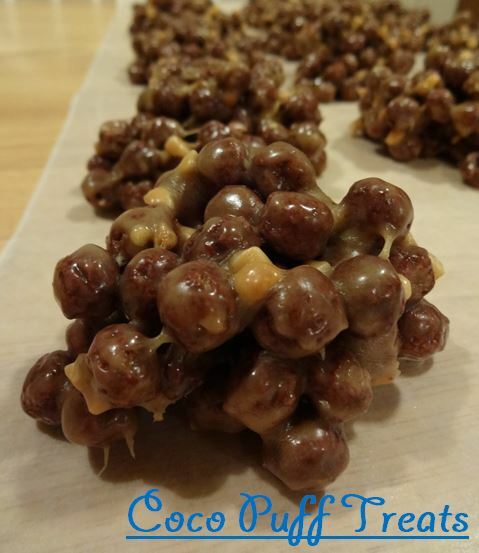 If you said yes to all of those, then I have a feeling you and I would get along very well and you will also love this recipe for Coco Puff Treats! This has been my go-to dessert recipe for years and it is always a crowd pleaser. But seriously, I’ve been making these for YEARS and still LOVE them! There is just something about peanut butter in a dessert that I just can’t get enough of. These are so fast and easy to make- you will be done with them within 10 minutes and then you can practice self control by not eating them all at once. Or go ahead and eat them all while they are still warm and gooey! On the stove top, heat sugar and corn syrup until combined. Bring to a boil and let boil for 1 minute. Remove from heat and stir in peanut butter until smooth. Put all of the cereal into a large bowl and pour the peanut butter mixture over the cereal. Mix until all of the cereal is covered. Scoop out your coco puff treats in little balls onto wax paper and let cool. You’re going to want to go make these bad boys right away. Trust me. I always have people ask me for the recipe and they are the first things to be eaten at parties. And now I want to make them for myself… I just might have to go to the grocery store tomorrow and get some cereal!